Nobody loves a great comeback more than the WWE Universe. Some of the greatest superstars have left the WWE for over a year and returned for a successful career rebirth. Here is a look back at the 10 greatest comebacks in WWE history. With Batista gearing up for a big comeback I thought it would be fun to take a look back at some of the all-time greats. Let’s talk about the criteria. I kept the list strictly to WWE stars that left for a minimum of one year for whatever reason. Guys like Eddie Guerrero and Triple H who great comebacks are unfortunately left off of the list because their WWE vacations lasted under a year. So before you start ripping the list for missing this guy and that guy please keep in mind the time frame. The guys that made this list are guys that either had just as or an even more successful run when they returned. A guy like Brock Lesnar for example wouldn’t make the list. While his return has been fun he hasn’t won a whole lot of matches during his return. A guy that returned and won a world championship but may not have been as exciting as Brock would have a better chance of making the list. Now that the criteria is out of the way let’s go back in time and take a look at the 10 best (in my opinion) comebacks in WWE history. Did I get it wrong? Did I miss one? Leave a comment and let me know. Bruno Sammartino (1963) – He was blackballed by the boss yet wound up returning to become arguably the most successful wrestler in WWE history. Bruno Sammartino left the WWWF after a disagreement with Vince McMahon SR. with limited opportunities. Bruno and Vince patched things up clearing the way for his return in 1963. Sammartino immediately won the championship from Buddy Rogers and became a pop culture icon of the times. A seven year run as the most dominant champion in WWE history lands my friend at the top of my list. Hulk Hogan (1983) – Hulk Hogan left the WWWF after headlining shows against Andre the Giant and WWWF champion Bob Backlund in 1980. Hogan returned in 1983 to begin the most successful run of a champion since Bruno Sammartino and maybe the most successful run of all-time. 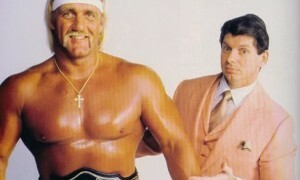 Hogan became an instant celebrity, remaining the most recognizable professional wrestler in history. Like Bruno, Hogan’s run boosted business and ushered in a brand new era of the WWE. Like him or not it is hard to argue with the history created during this comeback. Chris Jericho (2007) – He may not have had the historical impact of Bruno or the Hulkster but Chris Jericho’s run form 2007-2009 saw him cement his place in WWE history. The peak of the run featured one of the greatest feuds in WWE history between Jericho and Shawn Michaels. Jericho also captured the WWE world heavyweight title during this run and produced a Hall of Fame caliber list of fantastic matches. It started off rocky with a forgettable feud against Randy Orton but rebounded a few months later with one of the best comeback runs in history. Shawn Michaels (2002) – Michaels comeback from 2002-2011 is probably the greatest of any WWE wrestler in regards to the qualify of matches he put out during that run. Rarely does anyone ever that good come back after such a lengthy run and actually improve inside of the ring. His run wasn’t as decorated as some of the greats on this list as he only had one brief run with the WWE championship. Yet I can’t think of anyone that came in and left without missing a step better than the Heartbreak Kid. Sgt. Slaughter (1990) – The Sarge broke the hearts of American children everywhere when he returned to the WWE at the heigh of the Gulf War and aligned with the evil Saddam Hussein of Iraq. Slaughter achieved something he could never do during his two previous tours of WWE duty and that was win the WWE championship. Slaughter ended the reign of The Ultimate Warrior and went on to headline WrestleMania 7 against Hulk Hogan. While I’d never condone evil, it sure paid off for the WWE Hall of Fame wrestler during this run. Ted DiBiase (1987) – The comeback of Ted DiBiase (Sr.) is often forgotten when these kinds of WWE returns are discussed. Long before he was an arrogant millionaire, DiBiase held the WWWF North American championship and was a slightly above average mid-card guy. DiBiase went on to achieve much more when he returned in 1987 as the Million Dollar Man. DiBiase became an icon during this run and is remembered as one of the greatest heel characters in company history. DiBiase held the WWE championship briefly after he purchased it from Andre the Giant only to have it stripped by Jack Tunney. There aren’t many others that a better comeback than this guy in WWE history. Jeff Hardy (2006) – Jeff Hardy had a nice vacation in TNA for a couple of years after several run-ins with the WWE Wellness Policy. Hardy returned in 2006 and went from a mid-card wrestler to one of the most popular wrestlers of the era over the next year. Hardy headlined several events and even won the WWE world heavyweight championship during this run. I don’t think there has been any babyface that elevated himself the way Hardy did during this run since, although Daniel Bryan may give him a run for his money. It’s easy to forget about Jeff Hardy here but his comeback run deserves recognition as one of the best in company history. The Rock (2011) – The three year journey for Dwayne Johnson began with some of the most memorable promos of his career during the push to WrestleMania 27. Johnson headlined WrestleMania twice (three times if you want to be cynical), pinned John Cena, drew the biggest buyrate in Mania history, and won the WWE championship ending the 400+ day reign of CM Punk. Not too shabby for a guy from Hollywood. Jesse Ventura (1984) – This may be a controversial choice because his biggest success didn’t necessarily take place inside the ring with a WWE championship yet nonetheless this was a great comeback. However, Jesse’s return in 1984 ended with him earning legendary status as one of the greatest color commentators of all time. Ventura moved out of the ring before a scheduled big run with Hulk Hogan and migrated to the announce booth forming memorable teams with Gorilla Monsoon and Vince McMahon. This was quite a leap from putting over Bob Backlund a few years earlier if you ask me. Hulk Hogan (2002) – I wrestled (no pun intended) with putting Hogan on the list twice but after careful consideration he earned it. Hogan returned to the WWE in 2002 and held his own with the young lions of the time like Triple H, Steve Austin, The Rock, Kurt Angle, and Chris Jericho. Hogan not only put in arguably his best WrestleMania performance of his career against The Rock, he also won the undisputed WWE championship. I couldn’t think of anyone else whose comeback surpassed the achievements here which is why he makes the list twice.